Some MacBook Pro users have previously complained about a problem with the display, where the backlight to illuminate the screen would illuminate improperly as a result of damage to the cable, and show a “stage light” effect at the bottom of the display. 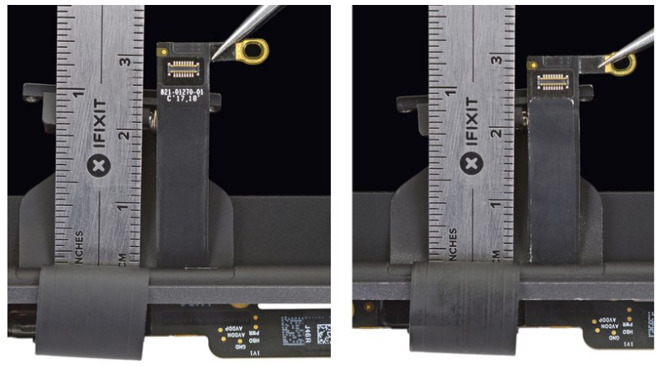 The problem, which affected models produced in 2016 and 2017 and at the time of original report was said to impact the 2018 model as well, was narrowed down to a thin flex cable that connected the motherboard to the display wearing down over time. According to iFixit, Apple has seemingly fixed the issue in its 2018 models, by lengthening the cable. A comparison of the 2018 and 2016 models found the cable had been extended by just 2 millimeters. As it was found to have been changed in the 15-inch MacBook Pro disassembled by the venue as well as in other customers’ 13-inch model, it is likely that Apple made it a general design change to all variants. “This is significant because it gives the backlight cable more room to wrap around the board and not come into contact with the board as the laptop is opened past 90 degrees,” advised iFixit teardown engineer Taylor Dixon. It is hard to determine how much of the issue is caused by length and how much by proximity to the board, as well as whether the cable still makes contact. Dixon advises it is impossible to tell if the rubbing is continuing. So, while this could solve the problem completely, it is also plausible it could just delay the failure of the cable for a bit longer. The issue doesn’t immediately appear to be affecting any other Macs. iFixit said it is concerned about the 2018 MacBook Air, which doesn’t use an identical cable design but still wraps them over the controller board and merges them with the display. Service data collected over more than 25 Apple-authorized locations and Genius Bars by AppleInsider still doesn’t suggest that there is any increase in display-related failures in the 2016 MacBook Pro and later, versus the 2015 model and earlier. At present, the display assembly failure rates in the older models excluding de-lamination of the Retina Display coating are approximately the same, and service numbers for the first year of service involving the display of all models are a bit lower in the 2016 through 2018 model versus the 2012 through 2015. The mechanism of failure of the display cable is alleged to be gradual tearing. Increased failure rates should be appearing in the service data for the 2016 MacBook Pro, but is not as of yet. One Mac owner has launched a petition calling on Apple to offer an extended warranty program. As of this writing, over 13,000 people have signed, up from 2500 when the issue was identified.